This sublime single breasted jacket promises to take your vintage your smart-casual look to a whole new level of chic. Slip into this lavish little number to effortlessly vamp up your outfit. 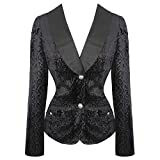 Be your style retro and rockabilly, or daring and dark, this Hearts and Roses jacket confidently vies for a place in your prize clothing collection. With its soft, velvety feel, and full lining, the high quality you expect from Hearts and Roses London shines through. It’s also cut to perfection, with a feminine line that shows off a waspish waist, making it the ideal accompaniment to your vintage style dresses to celebrate that sought after New Look line. Please note that this jacket offers a small fitting.